British and Australian forces handed over security responsibility for relatively peaceful Muthanna province to Iraqi forces on Thursday in the first such transfer of an entire province. Prime Minister Nouri al-Maliki hailed the security transfer as an important step toward the goal of full Iraqi responsibility for all 18 provinces by the end of next year. But at least 19 people were killed in attacks nationwide, illustrating the security challenge faced by this country. "It is a great national day that will be registered in the history of Iraq. This step will bring happiness to all Iraqis," al-Maliki said during a handover ceremony in the provincial capital of Samawah. "Be sure that the terrorists want to destroy and foil the process of taking over the security issue and to hamper the political process and the national unity government." In Samawah, Iraqi forces lined up in formation and led a parade of troops marching in formation past the prime minister and other dignitaries at a stadium in the city, about 230 miles southeast of Baghdad. Local tribal leaders wearing traditional Arab headdresses and robes then approached the tent, waving rifles and chanting "We are ready to die defending this soil." U.S. Gen. George Casey, the top American commander in Iraq, and U.S. Ambassador Zalmay Khalilzad welcomed the handover in a joint statement. "The handover represents a milestone in the successful development of Iraq's capability to govern and protect itself as a sovereign and democratic nation," they said. British Defense Secretary Des Browne the move puts the Iraqis "one step nearer to assuming full responsibility for their own security and to building a stable and democratic future for their country." The White House announced Thursday that Iraqi Prime Minister Nouri al-Maliki would be visiting Washington on July 25 to meet with President Bush. The two first met on June 13, when Mr. Bush made a surprise trip to Baghdad. A U.S. Army Apache attack helicopter crashed Thursday during a combat patrol southwest of Baghdad, but both pilots survived, the U.S. military said. The statement did not say what caused the crash nor give a precise location. However, an Iraqi army official in the area said the helicopter was shot down in the village of Grakoul, located near the town of Youssifiyah about eight miles southwest of Baghdad. A car bomb struck a police patrol in the oil-rich northern city of Kirkuk, killing four people, including a child, and wounding seven Thursday. A bomb also exploded near street sweepers in the southeastern New Baghdad neighborhood in the capital, killing two people and wounding one. Gunmen attacked a minivan Thursday that was coming from the Shiite holy city of Karbala to Baghdad, killing the driver and wounding four passengers. Gunmen at a fake checkpoint killed four policemen from Karbala after stopping their car in the volatile Baghdad neighborhood of Dora as they were heading home after a training course on Wednesday. 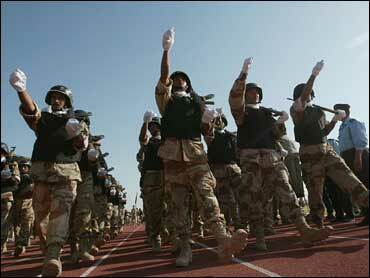 The international troops plan to maintain a presence nearby and be prepared to help the Iraqis if needed. That fits in with the overall U.S. strategy of having coalition forces hand over security control for specific regions and redeploy to larger bases, where they can act in a support or reserve role. A final future stage would involve the drawdown of troops from those bases. Sectarian violence continued to escalate, with a bicycle bomb striking the headquarters of a village council near Baqouba, 35 miles northeast of Baghdad. The blast in the village of Abu Saida, which has a slight Shiite majority devastated the 21-member local council's headquarters. The bodies of four council members were found under the rubble. Gunmen also killed a member of a provincial council in Diwaniyah, some 80 miles south of Baghdad, Lt. Raed Jabr said. Meanwhile, purported Shiite militiamen drove onto the streets of the western Baghdad neighborhood of Ghazaliyah and called on Sunnis to leave the neighborhood. Clashes broke out after police arrived on the scene, supported by U.S. forces in the air, with one policeman killed and two injured, Capt. Jamil Hussein said. Al-Maliki announced shortly after taking office on May 20 that he was optimistic Iraqi security forces would be ready to assume full responsibility for all of Iraq's 18 provinces in 18 months, paving the way for the eventual withdrawal of all coalition forces. He then said last month that Muthanna, a predominantly Shiite desert province of some 550,000 people, would be the first to have its security transferred to Iraqi forces, and Thursday's ceremony marked the transition. Japan also is in the process of withdrawing its 600 non-combat troops that were based near Samawah from the country, ending Tokyo's largest military deployment in the postwar era and the first to a war zone since 1945. Australia has about 1,320 troops in Iraq and the Middle East, including around 460 soldiers who had been guarding Japanese engineers in Samawah. Britain had about 170 soldiers in the province, a fraction of its 7,200 service members who are based in southern Iraq. "We were and are helping to build a strong peaceful democratic society in Iraq," said the British commander of coalition forces in southern Iraq, Maj. Gen. John Cooper, who signed the transfer document with al-Maliki. "Today is an important step in that process." He said coalition forces and trained and equipped 2,000 provincial policemen and 1,000 troops to guard the border with Saudi Arabia.